We were an hour too late. The market at Vinh Long took place on the waters of the Mekong Delta, the dramatic labyrinth of rivers, canals and islets that signal the end of South East Asia’s longest river, the Mekong. Boats heavily laden with fresh produce congregated near Vinh Long. This Mekong trading hub was nestled somewhere in the maze of murky brown waters like milky coffee, encroached on all sides by endless green riverbanks falling over the shoreline. Farmers and traders ferried watermelons, potted plants, pumpkins, fruits and veggies, and huge sacks of rice from farm to market, and from ship to ship. But by the time we arrived on our boat, just some stragglers were trading pumpkins. The houses in Hoi An ancient town were all painted in yellow, a washed, pale yellow. Rich, dark wooden beams and old sun-bleached timber planks built the shade, the support, the doorframes, the carved and ornate balcony railings. The roofs were tiled red and brown, lichen spotted and fractured and pouring on top of each other. Lanterns hung in reds and greens from balconies and doorways, bright and cheerful. Flowers exploded from top-level balconies, and tall potted plants completed the display downstairs. The doorways to restaurants and shops are wide open, and embraced walkers-by as they admired the wares for sale. And don’t forget Hoi An’s world famous tailors! Any clothes, any style, low price, 24 hours! Jeff and I were sunbaking under the hot Vietnamese sun, passing a large plastic bottle of clear liquid around the deck of the boat. Inside was tonic, with a considerable amount of cheap gin, and we were sharing it with the other passengers to celebrate my 26th birthday. What better way to celebrate than to visit majestic Ha Long Bay! The junk, one of hundreds of identical boats that cruised around the bay, was like a big, white, creaking wooden hotel. The cabins were downstairs, a main dining room/bar on the second level, and a lazy open deck on the top had long lounge chairs to enjoy the sun. Steel masts stretched upwards from the deck, but she rarely unfurled her distinctive sails. It’s old wooden hull protested and groaned as we sailed calmly around the bay, and shuddered with alarming splintery cracks when we docked alongside other junks. The streets of Hanoi rumbled into life in the morning like a great machine coughing into life, intoxicatingly fragrant with noodle soup, vibrating with motorbike engines, horns, shouting, conical straw hats, fruit and Buddhist shrines, pulsing and pumping like a heartbeat. Yet unlike the pantomime of certain tourist-laden streets in Ho Chi Minh City, there was always a feeling here that it was business as usual. I met Jeff at the airport immigration counter (by sheer coincidence), as he collected his visa, pre-arranged online (as is required for entry to Vietnam). We caught the bus into town, and a million motorbikes escorted us to the old town, a large sector of the city surrounding Hoan Kiem Lake. Spending time here can be as fast-paced or lazy as you want. Bia Hoi, if you know where to look, is locally brewed beer sold for something like 3-5,000 dong (10-20 Australian cents). And it’s damn good, too. Take a kid’s chair, order a Bia Hoi, and sit and watch the street chaos. Restaurants dishing out bowls of pho (Vietnamese noodle soup) spill out onto the sidewalks in a frenzy of tiny plastic kid’s chairs too. At night, the chairs remain, and youths crowd the sidewalks sipping mango smoothies and chewing sunflower seeds, their broken shells scattered across the pavement. Welcome to Vietnam. I’ve left South East Asia, and I’m pretty sad to say goodbye. Part adventure, part relaxation, but mostly just sheer madness, here are some of the best and worst of Malaysia and Vietnam (more countries to follow). I was waiting for my boat driver on the rickety wharf at Bako national park, Borneo. The sun was hot, the bornean sky an impossible blue, and the receding tide had revealed long stretches of muddy mangrove, home to a million scurrying crabs, pulling mud from their flooded homes and rolling it into balls. There was no shortage of monkeys here in the Malaysian jungle. Silver leaf monkeys played and jumped in the sky on a magic carpet of crawling jungle canopy. Proboscis monkeys barreled from tree to tree with clumsy urgency, their huge bulbous noses and swollen bellies making them look like living muppets. In nearby Semenggoh Orangutan Rehabilitation centre, the great orange apes showed us that their arms were longer than Tim’s, climbing down trees with the stealth of a dancing clown, taking four handfuls of bananas from the feeding area, and loping up their tree with the fruit grasped by each hand and foot. While I waited for the boat, I held a plastic bag containing 3 days of jungle-ripe laundry. The scent attracted the attention of a rowdy troupe of macaques, who leapt upon the bag with fury, tearing at my laundry until I yelled and shooed them away. But thats just one bad egg. I still love monkeys! It was a hulking monster, the dark grey of a brooding storm, 45 tons of heavy steel, it’s hard unsmiling face festooned with a big white star. A war machine, angular, menacing, fearsome. It was an American tank, on display in front of Saigon’s War Remnants Museum. As Jeff and I posed for a brotherly self portrait in front of the tank, a figure ran up to photobomb the photo. It was long-lost Matt. We had planned to meet him and Alysha later in the day, but here they were, a chance encounter in the city of Saigon. It was hot in Hue. Really hot. Beads of sweat collected on my forehead. And yet here we were, choosing not to lie in air conditioned comfort with a cheap bottle of local beer, choosing instead to ride bicycles to explore the outskirts of the ancient town. Jeff and I sat at the long, wooden table, set with chopsticks, chilli sauces and pieces of raw meat and bamboo shoots. I smiled at the H’mong tribeswoman sitting next to me. To our right was the fruit and vegetable markets, trading piles of fresh produce beneath canopies of tin and tarpolean. To our left, and under the same roof as us, was the butcher, whole bullock legs and forests of chicken feet sticking comically in the air. But we were here for pho, Vietnam’s famous rice noodle soup, and this particular stall was the best in town. 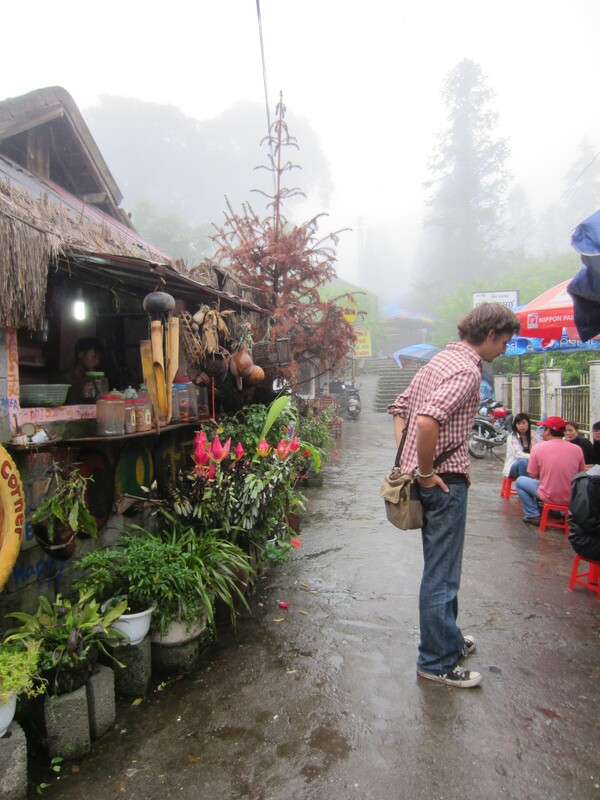 We were in Sapa, our second day, a town high up in the mountains of Vietnam’s northwest. It felt like a seperate country to the Vietnam I had already seen. This was the off-season, for the reason that the views of the valleys and mountains were mostly obstructed by an eerie white mist, it’s cold ghostly fingers permeating even the rooms of our hostel. But to me, it contained a certain mystery. I knew that I was standing on a cliff, but what lay beyond?